It seems that if you aren’t a New England Patriots fan then you are passionately rooting against them — no matter who they’re playing! In the wake of Sunday’s AFC and NFC Championship games which saw the New England Patriots win a spot in their second consecutive Super Bowl (and third in four years) after beating the Jacksonville Jaguars, and the Philadelphia Eagles triumphant over the Minnesota Vikings — the Twitterverse was not divided over who it was rooting for. 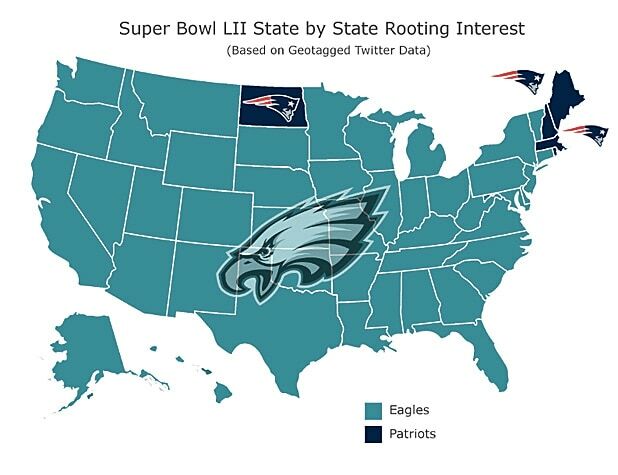 A virtual map based on geotagged Twitter data immediately after Sunday’s games shows that the entire U.S is hoping for an Eagles upset over Tom Brady and company — aside from the New England states (Massachusetts, Maine and New Hampshire), and bizarrely, North Dakota. Even Vermont, which is only 233 miles from the Patriots’ Gillette Stadium, is going green. The data was compiled and mapped by the NFL guys over at betonline.ag, using software with direct access to geotagged twitted data. It is based on fan hashtags and phrases like #flyeaglesfly, #goeagles, #gopats, #gopatriots, etc. The Patriots are currently favored by five points over the Eagles in Vegas, but according to SportsLine’s Micah Roberts, the line should continue to move toward the underdog Eagles over the coming days. The last time the Patriots went to back-to-back Super Bowls was after the 2004 season — when they faced none other than the Philadelphia Eagles. The Pats went on to win in a 24-21 nail-biter, which will give Philadelphia fans added incentive to quash 40-year-old Brady’s dreams of a sixth Super Bowl ring. Super Bowl LII airs live on NBC at 6:30 p.m. ET from U.S. Bank Stadium in Minneapolis, Minnesota.